WHEN he took the reins as chief executive of Kaneohe Ranch Co. four years ago, Mitch D'Olier had a plan and a vision. Last week, D'Olier said the vision he had for Kailua Town is coming to life. At the centerpiece of Kaneohe Ranch's redevelopment: a 40,000-square foot Whole Foods Market and a state-of-the-art First Hawaiian Bank built from the ground up. First Hawaiian's new branch is slated to open in 2009, and Whole Foods in 2010. "You've got to love Kailua for what Kailua is," said D'Olier, who considers it 180 degrees different from Kakaako on the other side of the tunnel. It seems as if the town is becoming more upscale, catering to the yuppie demographic that would shop for sun chairs at Pier 1 Imports and organic salad at Whole Foods Market. But D'Olier insists that the vision outlined by a community planning process has stayed the same, and that Kailua is a place that supports small businesses. Whole Foods was simply an opportunity that came along for Kaneohe Ranch. 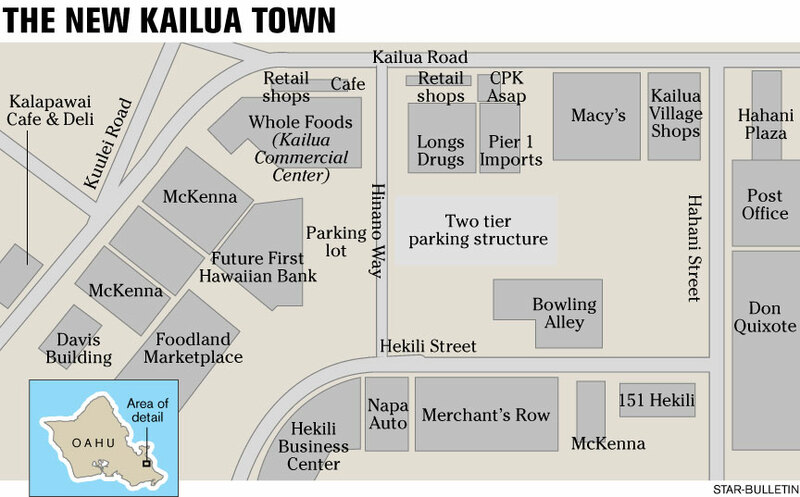 His vision for Kailua Town: a more pleasant place to stroll and dine, with more shopping options, which will include a mix of national retailers and local shops. With the new developments come growing pains -- meaning some 50-year-old buildings will have to be demolished to make way for the new arrivals. Other buildings will be refurbished. 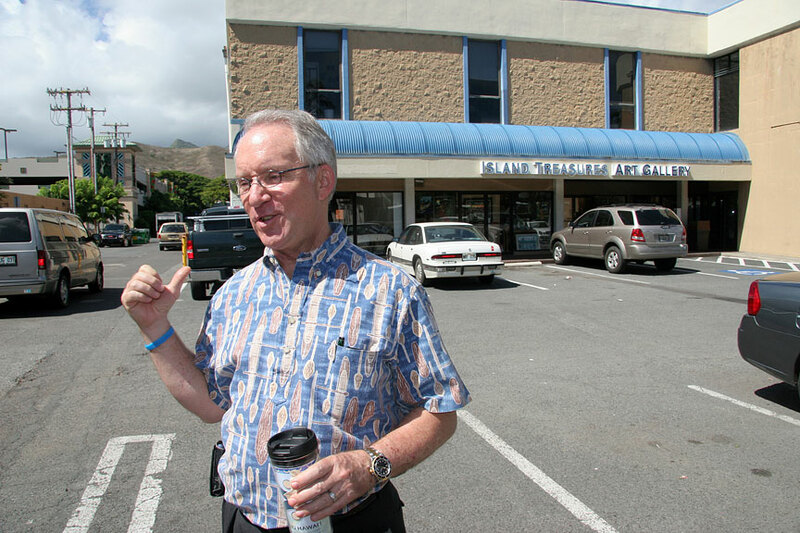 The Star-Bulletin takes a stroll around town with D'Olier, as he outlines what will be built and what will be demolished and spouts off on what he loves so much about Kailua. As he strolls around town, Mitch D'Olier, chief executive of Kaneohe Ranch Co. is seeing his vision for Kailua come to life. Since a community-based plan was outlined three years ago, the new Longs Drugs has gone up, along with the parking garage behind it, a suite of new shops along Kailua Road, and an open-style plaza. A dozen new tenants have moved to downtown Kailua over the last few years, the largest ones being Pier 1 Imports and California Pizza Kitchen ASAP, and perhaps the catchiest being local resident Wally Amos' Chip & Cookie shop. Sidewalks were widened, utilities went underground and medial strips went in on Kailua Road to make it more pedestrian friendly. Now a 40,000-square-foot Whole Foods Market, along with a new First Hawaiian Bank branch, both to be built from the ground up, have become centerpieces for the town's redevelopment. "We're carrying out the plan," said D'Olier, while comparing blueprints, before and after. Kaneohe Ranch will build the Whole Foods store and lease it to the Texas-based natural foods retailer in 2010. First Hawaiian Bank, meanwhile, will build its own branch on a ground lease good for 55 years, in 2009. The overall renovation cost to Kaneohe Ranch for its redevelopment in Kailua is $35 million -- small fry compared to the $150 million development across the tunnel at Ward Village Shops. But Kailua is not Kakaako, where D'Olier once held the reins for Victoria Ward Ltd. D'Olier said: "You've got to love Kailua for what Kailua is." D'Olier makes regular coffee stops in Kailua town, and he browses the shops, and he walks around to test out the pedestrian-friendly factor. His goal is to make Kailua town a pleasant place to stroll and dine, while updating its look and bringing in new shopping options. He went for a mix of national retailers while keeping many of the local shops. The Whole Foods Market deal, he said, was an opportunity that came along. "We thought they'd be a great fit and that the brand would be appropriate for the lifestyle in Kailua," said D'Olier. The new Whole Foods will be next to the new Longs Drugs, and also will offer 5,500 square feet of shops fronting Kailua Road. D'Olier envisions that stretch of Kailua Road as a "pedestrian streetscape" lined with small merchants. "We thought they'd be a great fit and that the brand would be appropriate for the lifestyle in Kailua." Chief executive of Kaneohe Ranch Co. with Kimo Steinwascher, left, vice president-leasing and development for Kaneohe Ranch. They are at the Pier 1 Imports area that features a tiled fountain, dog fountain and paintings. Whole Foods will feature a café with outdoor seating at what is now the parking lot fronting Kailua Commercial Center at the corner of Hinano Way. First Hawaiian Bank will take a spot in the current parking lot behind the McKenna auto dealership to build a new branch, with drive-thru teller windows , new private banking and investment services, and an expanded staff. D'Olier's vision: A one-stop shot for the customer that parks in the lot. That customer can go to the bank, pick up a prescription and shop for groceries. As it turns out, six grocery stores -- Don Quijote, Foodland, Safeway, Times, Down to Earth Natural Foods and Whole Foods Market -- will be within a half-mile of one another. But D'Olier said he still wants to keep the character of Kailua Town, which in his opinion does not look like Ward Centers at all. 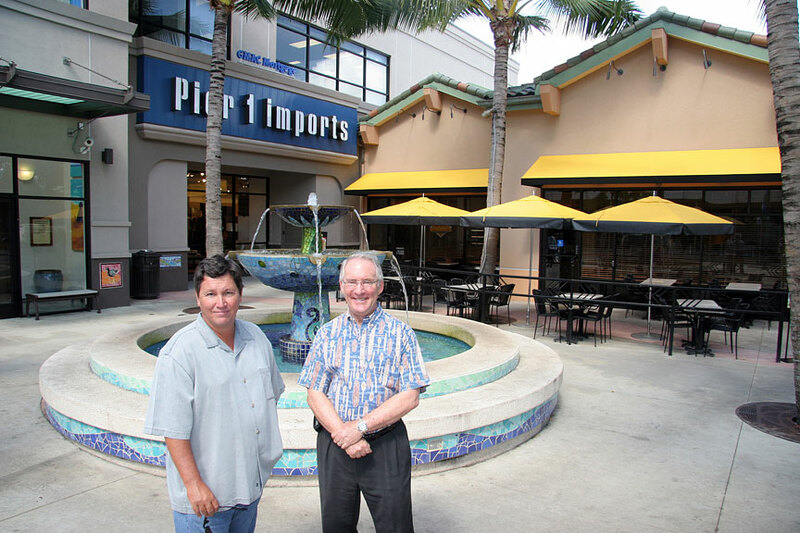 "I don't think there's anything this beautiful at Ward," he said, referring to Kainalu Plaza at the Pier 1 Imports and California Pizza Kitchen ASAP corner. This plaza, he said, formerly part of the old Longs, could have been more retail square footage, but instead it was designed to be a public gathering place. D'Olier pointed to the mosaic art, including a water fountain, and a drinking fountain for dogs. This was included, he said, because Kailua is a dog-friendly town. Art sculptures, and art pieces, decorate the town, because an art budget is built into every development. Most times, said D'Olier, Kaneohe Ranch tries to hire a local artist. From a real estate perspective, the Kailua today is not the same as the one yesterday. The real estate value of beachfront homes shot up into the multimillion-dollar range, setting new records during the peak of the market a year and a half ago. Despite a slowing market, the prices continue to maintain their heights. A block of rental apartments -- probably the last of affordable housing -- in rundown walkups along Kailua Road will be developed into market-rate condos by the D.R. Horton Schuler Division. 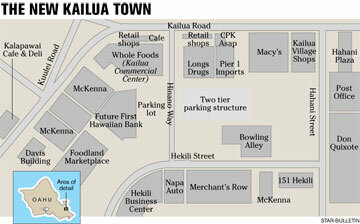 In Kailua Town, meanwhile, progress comes with growing pains. The new Whole Foods will displace tenants at Kailua Commercial Center (629 Kailua Road), which will be demolished, along with the existing First Hawaiian Bank. The center is currently home to a handful of tenants including Island Treasures, Bead It! and Supercuts, along with Goodwill and a dentist's office. "We are working on relocating every tenant," D'Olier said. Hawaiian fashion shop Manuheali'i moved across the street to Kailua Shopping Center earlier last week. The Straub Clinic already moved across the street, and GMAC Mortgage moved upstairs of Pier 1 Imports. Island Treasures owner Gail Allen welcomed the arrival of Whole Foods. Allen herself has expanded over the years, with three side-by-side stores across the street at the Malama Building, including So Kailua, Red Bamboo and Kailua Beach Walk. 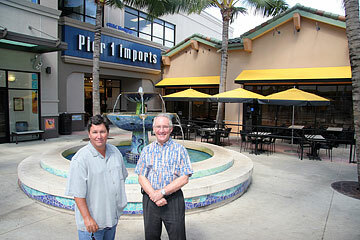 "Knowing the customers we have here in Kailua, I think it's going to be a good fit," Allen said. She said Island Treasures would find a temporary home, and hopefully move back to its original location once construction is complete. Sales at her boutiques over the last year have gone up about 10 percent, she said. The sleepy beach town has become a destination spot for tourists as well as residents from the other side of the tunnel, she said. Half of her customers are visitors, half local residents. With good restaurants, with new ones to come like Formaggio Grill, and hip little boutiques, she said Kailua was becoming a happening town. D'Olier calls the architectural style of Kailua eclectic. Though the newly renovated Longs Drugs will match the incoming Whole Foods Market next door, other parts of Kailua will continue to be made up of a mix of old and new. The Macy's building for instance, is a throwback to the '60s. It's owned by Macy's, said D'Olier, and it's up to the retailer what it wants to do with it. As ground leases expire, and buildings return to the Kaneohe Ranch portfolio, the management company decides whether to restore or redevelop. Many of the buildings, at 50 years or older, don't conform to current codes. Kailua Center, an office building at 116 Hekili St., now home to mostly real estate and mortgage companies, will be demolished in 2009 to make way for more parking. In some cases, the refurbishment route is preferable, as was the case with 776 Kailua Road, formerly home to Wayne's Flooring America at the gateway to town. Kaneohe Ranch is renewing the building to its original '50s glory to lease to a new tenant. It is next door to another new project, the new Kalapawai Café & Deli. But for 151 Hekili St., Kaneohe Ranch is planning a new, 20,000-square-foot retail and office center to replace the one-story wooden retail building, home to Kimo's Surf Hut, Mac Made Easy and the Kailua Movement Dance Studio. Walking along Hamakua Drive past the Foodland marketplace, D'Olier also envisions a walkway along Kawainui Marsh and maybe a walkway connecting it to the park across the street at the top of the Pali Highway.